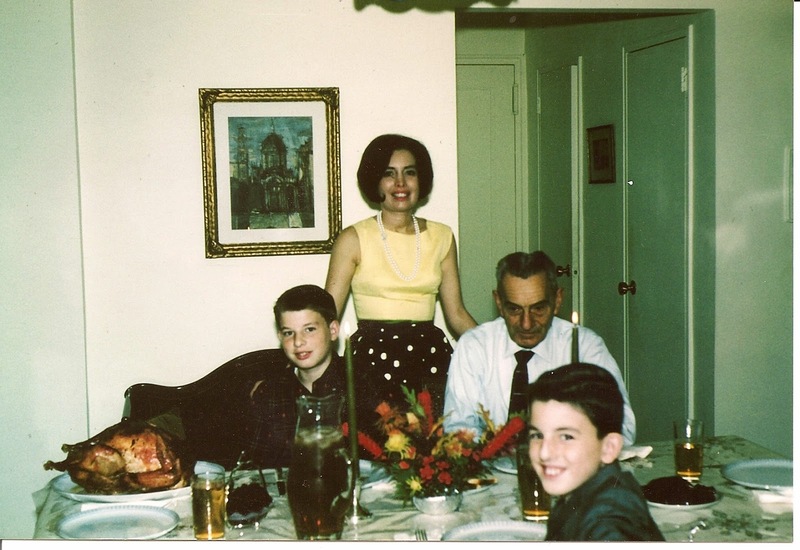 I always thought this photo was taken on Thanksgiving Day 1963. Recently I realized that it was taken in 1965. or maybe 1965. The proof is in the outline of the love seat in the background, which was my Great Aunt Katherine’s, who had passed away earlier that year. I know it was after her passing, as she was very strict about relatives removing her furniture and would never have allowed us to “borrow” it. The photo is a real "keeper"; which I have obviously done. Uncle I is looking a bit fatigued; probably wondering why he can’t afford to spend the winter in Florida like Benny the Good Humor Man. Mom is just happy to be out of the hospital in time for the holiday and you can see how glad I am. My buck teeth are smiling like Bugs Bunny. Even my brother is actually looking happy; which was unusual; so it’s a great photo. My father took the picture. Thanksgiving is about giving Thanks; but it's also about making memories. So, wherever you are today - make some. Hey, that’s not a half bad prayer. I may use it at dinner tonight. Have a great Thanksgiving wherever you are.